Jennie DiBeneditto’s piece titled “Welcome to Jeffersonville”, features an 8 foot tall by 16 foot wide mural painted on segmented panels. The fresh and bold color palette catches your eye as you look down from a stroll on the walking bridge. The piece welcomes visitors and residents alike and holds within its composition several iconic images. A tall stack paying homage to our riverboat heritage frames the composition’s left edge while a scene of roses pays tribute to the Rose Hill Neighborhood (which the piece is on display in) and creates a whimsical corner. 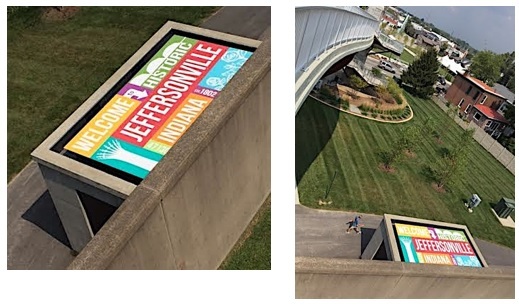 Like a giant welcome mat to our community, this piece sets a feeling of friendliness, pride and fun for those entering Jeffersonville, Indiana! Come out to the mural site Tuesday, October 6th at 6:00 p.m. to meet the artist and be a part of history as we dedicate the mural to Jeffersonville –and cut the ribbon together! Attendees are encouraged to wear bright colors, as they will be a part of a HUGE group photo taken on the ground by a drone overhead! Those that arrive early will get a Jeffersonville Art pin as a memento! This event is free and open to thepublic.